The singer is a tattoo enthusiast! Demi Lovato may be just as passionate about her tattoos as she is about her music. The singer has been getting inked since she was a teenager. But, getting tattoos is much more than just a fun hobby for Lovato. Lovato's tattoos also serve as a healing factor for the singer. Most of her tattoos are reminders of what she's overcome in her life and her journey to becoming a healthier, happier person. Every single one of Lovato's tattoos holds a special, very deep meaning for her - and she has quite a few pieces of ink. So what are Lovato's tattoos? And what are the significant meanings behind them? Here are all of Demi Lovato's tattoos and what each means to her. 1. "You Make Me Beautiful"
This was the singer's very first tattoo. She was only 16 when she got it. Lovato explained her reason for getting tattooed so young in an interview. "I was 16. And I got it in some tattoo artist's apartment. Like it was so sketch, it was in L.A. But I wanted to get tattooed so bad. I do things out of rebellion. So that was like one of the main reasons why I got it so young." The tattoo is on Lovato's ribs and is the words, "You Make Me Beautiful", which she explained were the lyrics to a favorite song of hers. 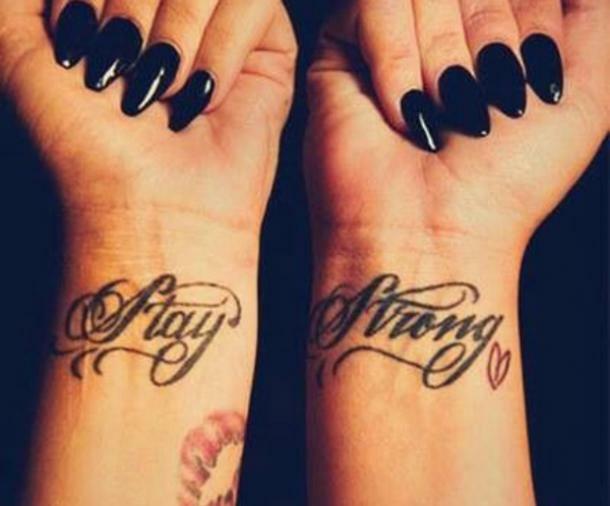 Lovato herself has admitted that the words, "Stay Strong" written across her wrists are the most meaningful ones to her out of all of her tattoos. These were some of the singers very first tattoos - people first noticed them back in 2011. Lovato has explained that the tattoos are partly dedicated to her fans who supported her, but also a very important reminder to herself about staying healthy and strong. "When I got out of rehab that's the first thing that I did is I went and got tattooed 'Stay Strong' because a lot of fans were telling me that and it helped me get through a rough period. so anytime that I would feel triggered to either self-harm or act out in an unhealthy behavior, I could look down at that and stay strong." 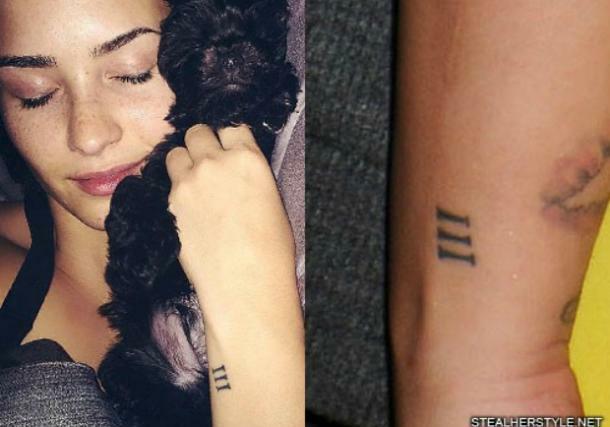 On the outside of her left wrist, Lovato has a tattoo of the number three in Roman numerals. It's one of her smallest and most subtle pieces of ink - but it's also one of her most personal ones. She got it in honor of her father, who passed away in 2013. "I have the number three in Roman numerals on my wrist and that was a number that was very significant to my birth father because he loved Dale Earnhardt. So when he passed away I got the number three tattooed on me to remind me of him. One of the singer's most distinctive tattoos is the 12 birds going up her forearm. The ink was done by famous tattoo artist Kat Von D. Lovato knew her through a friend and said that getting this tattoo was an "impulsive" decision. "I love the freedom that birds represent and I didn't specifically have a huge reason why I got 12 of them. But one day, one of my friends that I was at Sober Living, I was living in her Sober Living house, and they asked, 'So why'd you get ... How many did you get?' And I was like, "I don't know. One, two, three, four, five, six, seven, eight, nine, ten, eleven, twelve, and I was like, 'Whoa, I didn't mean to do that.' But it's like, it was kind of like a God thing, like I worked the 12 steps, so as I got that while I was in Sober Living, apparently it was really meant to be." 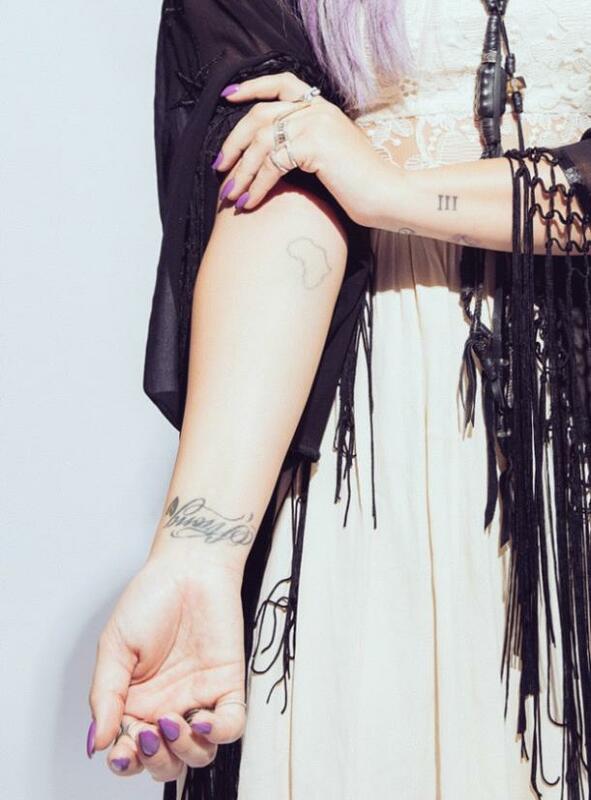 Lovato has the outline of the country Africa tattooed on the inside of her right forearm. The singer took a mission trip to Kenya for her 21st birthday, which she has said inspired the tattoo. She also explained why she chose to get the tattoo of Africa instead of Kenya. "I got Africa tattooed. I went there for my 21st birthday. I went to Kenya and it was just a very, very inspirational journey that I feel like really had a huge impact on my life. And, I would've gotten Kenya but then people would have been like, "What's that?" (Laughs) So Africa's a little more distinct." 6. "Let Go And Let God"
Lovato has the words "Let Go And Let God" written across the top of her feet. The singer has never really explained the meaning to her behind this one. However, she has posted the same phrase on her Twitter before and it's a popular phrase that means you turn your troubles over to God. 7. "Now I'm A Warrior"
In 2013, Lovato had these lyrics from her song "Warrior" tattooed across her shoulder blade. "Warrior" was the final song on the singer's fourth album and the tattoo is very significant to her as its both a tribute to the album and also refers to becoming a stronger person against the struggles in her personal life. Although Lovato admitted to having a high tolerance for pain when it came to tattoos, she said that her finger tattoos are the ones that hurt the most. "I have finger tattoos. It says 'Rock and roll' and 'Peace,' and that one hurt." This is Lovato's other finger tattoo, which appears on the inside of the middle finger on her left hand. This tattoo is one of Lovato's most meaningful. Along the inside of the singer's foot are the words, "Buddy was here" as a tribute to honor her dog, who passed away in a tragic accident in 2015. Lovato chose the font of the tattoo, because she wanted it to look specifically like a child's handwriting. The singer has a bright turquoise feather inked behind her ear. It doesn't seem to have a meaning - at least not that we know about. But, maybe this one just isn't supposed to have one! Lovato has a cross inked in black on her hand. The tattoo represents the singer's devotion to her religion. The new ink could also be a nod to her recent struggles with relapse and trying to start over fresh. During one of her recent performances, the singer even alluded to breaking free of life's struggles and being happy. "Life is really, really funny sometimes. It can be difficult, but, for the most part, if you do what makes you happy and set yourself free, you’ll live an amazing life." Another one of Lovato's more recent pieces of ink is the gigantic lion that takes up the back of the singer's hand. 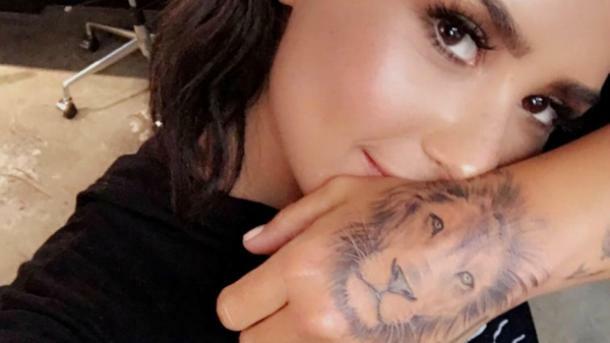 Lovato hasn't revealed its meaning, but she did say that it definitely has nothing to do with Cara Delevigne and Justin Bieber, who also have lion tattoos. Lovato has a very tiny smiley face tattooed on her pinky finger. The singer revealed the small tattoo on her Instagram page in 2016. When she got the tattoo, Lovato was dating UFC fighter Luke Rockhold, who had the same exact tattoo on his pinky. 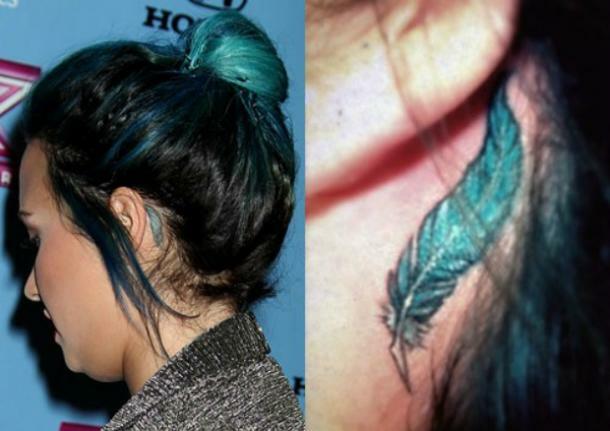 This piece of ink is right next to Lovato's tattoo of the birds (however, she got this tattoo first). 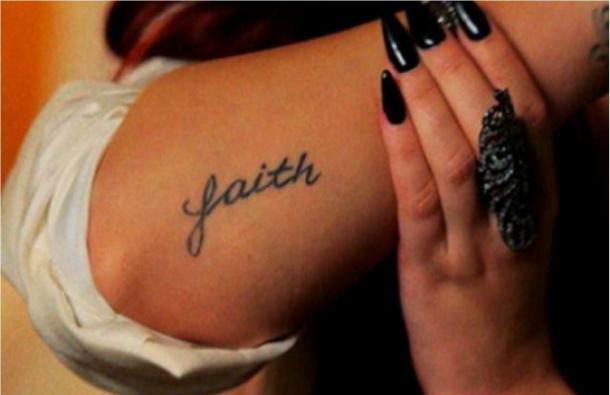 Back in 2011, she got the word "faith" tattooed on her arm. “It’s a matching tattoo with one of my friends [Lauren Martin] that I met in treatment,” Demi says about the meaning of her faith tat. Lovato celebrated the end of her treatment in rehab with this tattoo. 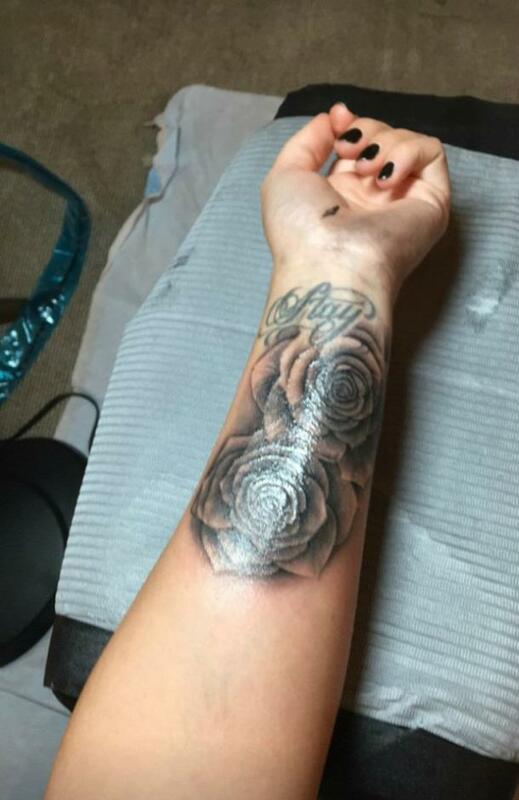 In 2015, Lovato had a large rose tattooed on the inside of her wrist. She mainly had it done to cover another older tattoo of a kiss that she no longer wanted. 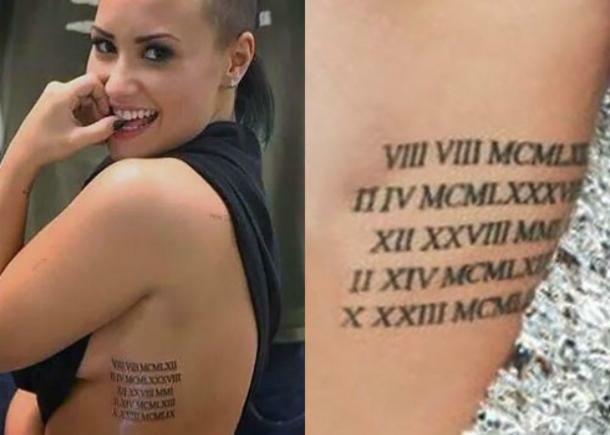 Lovato added to her growing collection of ink in 2014 with a long tattoo of Roman Numerals going down her rib cage. The numerals all stand for the various birthdays of her family members, including her sisters, her mother, her father, and her step-father. This was the singer's fifteenth tattoo. The singer added to her very first tattoo, "You Make Me Beautiful", with another large, intricate tattoo of a dream catcher. Lovato had the tattoo done in 2016 and followed up with a tweet expressing how much she enjoys getting tattooed. She tweeted the sentence, "Why is the feeling of getting tattooed so addicting?" At the same time as the dream catcher, Lovato also added a second rose to her original rose tattoo on her wrist. The singer showed off the new ink on her social media.